Askmelah’s note: in this article, Dr. Lee has recaptured some of the intimate final moments of her mother’s passing and the unfailing love of ex-PM Lee Kuan Yew for her. 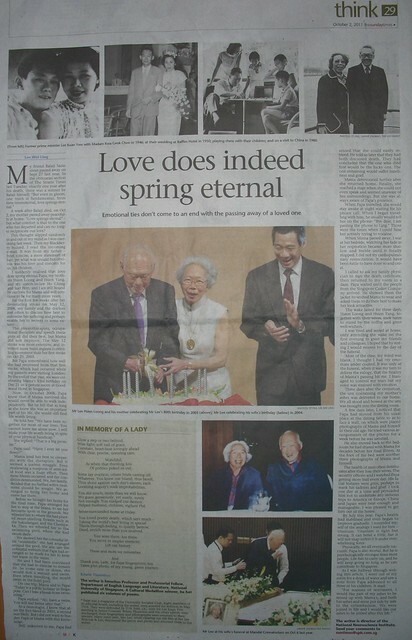 Lee Kuan Yew not only will be remembered as a great statesman but also a great lover and a great father. A week after Balaji died, on Oct 2, my mother passed away peacefully at home. ‘Love springs eternal’ – but what comfort is that to the one who has departed and can no longer reciprocate our love? This thought slipped randomly in and out of my mind as I was exercising last week. Then my Blackberry buzzed. I read the incoming e-mail. It was from my father – brief, concise, a mere statement of fact, yet what was unsaid but obvious was his love and concern for us, his children. For the first few weeks after her devastating stroke on May 12, 2008, my family and the doctors met often to discuss how best to minimise her suffering and perhaps enable her to recover to some extent. The physiotherapists, occupational therapists and speech therapists all did their best, but Mama did not improve. The May 12 stroke was more extensive, and involved more brain regions controlling movement than her first stroke on Oct 25, 2003. But Papa remembered how well she had recovered from that first stroke, which had occurred while my parents were visiting London. By the end of that year, we were celebrating Mama’s 83rd birthday on Dec 21 in a private room at Goodwood Hotel in Singapore. Mama tried her best to cooperate with the therapists. But it seemed a useless struggle. Even swallowing a teaspoon of semi-solid food was a huge effort. Then more bleeds occurred and her condition deteriorated. We, her family, decided that no further active treatment should be sought. We arranged to bring her home and nurse her there. We showed her the colourful little ‘windmills’ she had arranged around the pool. She also saw the colourful wetsuits that Papa had arranged to be made for her to keep her warm in the water. He and I had been convinced that she had to exercise to remain fit. So come rain or shine, she would don a wetsuit and swim. Even when travelling, she would swim in the hotel pool. As a neurologist, I knew that after the first bleed in 2003, a second was likely. But I did not want to burden Papa or Mama with this knowledge. Mama deteriorated further after she returned home. Finally, she reached a stage when she could not even speak and seemed unaware of her surroundings. But she was always aware of Papa’s presence. When Papa travelled, she would stay awake at night waiting for his phone call. When I began travelling with him, he usually would tell her on the phone: ‘Bye dear, I am passing the phone to Ling.’ Those were the times when I could hear her actively trying to vocalise. I called to ask my family physician to sign the death certificate, then returned to my room in a daze. Papa waited until the people from the Singapore Casket Company arrived. He showed them the jacket he wished Mama to wear and asked them to do their best to make her look attractive. The wake lasted for three days. Hsien Loong and Hsien Yang, together with their wives, took turns to stand by the coffin and greet well-wishers. I was tired and rested at home, only attending the wake on the first evening to greet my friends and colleagues. I hoped that by resting I would recover by the day of the funeral. Most of the time, my mind was blank. I thought I had my emotions under control. It was only at the funeral, when it was my turn to deliver the eulogy, that the finality of Mama’s passing hit me. I managed to control my tears but my voice was strained with emotion. Three days after the cremation, the urn containing my mother’s ashes was delivered to our home. We all stood and bowed as the urn was brought into the dining room. The health of men often deteriorates after they lose their wives. The security officers and I watched Papa getting more frail every day. His facial features were grim, perhaps to mask his sadness and grief. I took one day at a time and persuaded him not to undertake any arduous trips to America or Europe. China and Japan were near enough and manageable. I was pleased to get him out of the house. By July this year, Papa’s health had stabilised and even begun to improve gradually. I reminded myself of the analogy I used for him – titanium. Titanium is light but strong. It can bend a little, but it will not snap unless it is under overwhelming force.